And now we finally reach the home stretch of this thing as we enter season 10 of Stargate SG-1. Onboard one of the ships of the Ori first wave Vala gives birth to her child, a girl, whom the Prior proclaims as their prophet, the Orici, who will guide them to victory over the non-believers. While Vala isn’t initially allowed to see her the child is soon brought to her though has already grown to a young infant. Meanwhile in the debris field Carter floating in space in her EVA suit and Mitchell in an F-302 regain communication with each other. While they initially think they’re the only survivors it turns out the US Odyssey survived but had been heavily damaged during the fight along with the Lucian Alliance command Ha’tak with Teal’c onboard, though Teal’c is taken into custody. The Lucian Alliance ship, believing that the SGC deliberately brought them to a lost fight, demand the Odyssey surrenders. Back on the Ori fleet Vala goes to see her child again, finding her having grown to around 7 years old already. Vala, finding that the girl has no name, decides to name her Adria supposedly in honour of her own mother. Finding that the girl is already a devout believer in the Ori and refuses to listen Vala leaves the room only to find Daniel waiting for her on the other side. Vala, after revealing the situation to Daniel (which includes the fact that the name Adria belonged to her hated stepmother) tries to get him to understand just how much of a threat she is to the galaxy before being forced to hide him as Tomin reappears. In the debris field things look bad for the Odyssey until Bra’tac arrives with more ships to help them. Eventually they open fire on the Lucian Alliance vessel, destroying it, though Teal’c is thankfully beamed away before it goes up. The celebrations are cut short however when Bra’tac reveals they’ve found where the Ori fleet are going. With the Ori fleet Tomin is called away by a general alarm as the fleet comes out from hyperspace above Chulak, the birthplace of the Jaffa Rebellion. The Ori’s initial attack is once again largely a slaughter, easily destroying the small defence force. After most of the ship’s compliment empties to subdue the planet Vala once again goes to try and convince Adria to stop the crusade, only to find her daughter has aged once more to around 12 and has started to develop her mental powers similar to the Priors. As Vala attempts to convince Adria Daniel is discovered by Tomin and brought in. Adria orders Tomin to kill Daniel but accidently wounds Vala instead, giving Daniel the perfect opportunity to stun the two. Before they can escape however a Prior arrives, forcing Daniel to choose who to rescue out of Vala and Adria. Above the planet Bra’tac’s three Ha’tak vessels, with the rest of SG-1 on board, attempting to at least do damage to the Ori vessels. 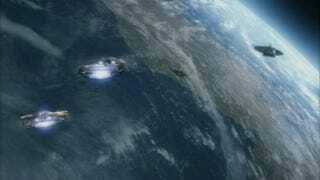 The Ori vessels easily deal with two of the Ha’tak, with Bra’tac beginning a suicide run on one of the Ori ships. The Odyssey arrives and beams out Bra’tac and SG-1 from the Ha’tak just before it crashes, doing no damage to the Ori ship. The Odyssey also beams out Daniel, who’d chosen to save Vala. In the ship’s medbay the team decide what to do next. So here we are with the start of season 10 and the immediate aftermath of the attempt by the Alliance to stop the Ori in their tracks and also the much-awaited return of Vala. The main story focus of the episode is the arrival of Adria into the world all the problems that’s likely to cause in the future. Despite Vala’s belief that it’d still be a normal child she could influence the girl is instead shown to be Ori in human form, believing even more so than the Priors in the goals of the crusade and its violent nature. Pretty soon Daniel arrives on the scene as well and tries to help Vala steal Adria from the Ori, only for it to end predictably badly with them instead barely getting out themselves. The conversations between the two are as fun to watch as before and I’ve sorely missed them since the beginning of season 9. Their personalities brilliantly complement one another, with each of them driving the other slowly other the cliff while using it to disguise the bizarre friendship they have already. Adria however causes a strange flip in their respective positions as well, with Daniel being the one who regrets not killing Adria when he had the chance while the previously quite easy going Vala refuses to hurt a hair on her head despite knowing just what she plans to do with her powers. Similar as to with Adria Vala continues to have her weakspot in the form of Tomin as well, rightly seeing him just as much a victim of the Ori as those he’ll end up forced to kill in their name over the course of the crusade, with her wanting to have saved him if she had gotten the chance as well. Vala’s wanting to save both Adria and Tomin becomes a focal point of the season from her on in, with their confrontations frequently turning into emotionally charged events. The episode’s other story follows the fall of Chulak to the Ori, the first to fall after the arrival of the invasion fleet. The choosing of the target is shown to be deliberate by the Ori, showing a propaganda element to their war, knowing that the loss of the birthplace of the Jaffa Rebellion is likely to significantly damage the Jaffa’s will to fight. Once more the home of both Bra’tac and Teal’c is plunged into open war as the Ori quickly take control of the world and begin their campaign of religious conversion. We quickly see the effect of this loss on the wizened warrior who, after being the logically face of the Jaffa who always thought things through, launching a suicide attack even though he knows it’s pointless simply because of the fact it’s Chulak being attacked. This method by the Ori is a big change from the Goa’uld and Replicators who previously focused their efforts simply on brute force conquest with little tactical or strategic planning and makes them at least appear to be a different threat than the team faced before. In the end the episode is a great introduction to the character of Adria and how she changes the game for the characters on the team and shows that the Ori are already a step up from previous foes the team have faced in the past, putting the SGC on the backfoot already. · Funny how none of the Yanks try to save any Russians. Clearly the Cold War goes on. · Already the IOA causing problems. Gee, what a surprise. At the SGC things are starting to grow worrisome as more and more planets begin to fall to the Ori in quick succession. Daniel however thinks he’s tracked down the Gate address for one of the planet’s visited by Arthur to find Merlin’s weapon. While the mainstay SG-1 prepares to go Vala is forced to stay behind as she has to undergo an evaluation before she can join frontline operations. Arriving on the planet the team find themselves in abandoned ghost village #34, only finding a bunch of long dead corpses inside their beds. The team decide to bring in a medical team to explore what happened and what may have killed them while Daniel looks through the town’s records, finding reference to Morgan Le Fay residing in a cave nearby which may have the answer to what happened. Finding nothing the team prepares to head out only to find one of their number is missing, finding him in the village in a comalike sleep. The rest decide to try and stay awake as long as possible. On base Landry goes to see Vala before her psychiatric evaluation, who seems to think you can pass a test with certain answers as though it was an interview. Heading to the interview Vala begins to drive the psychiatric up the wall with her attempts to be the perfect interviewee, such as giving bizarre positive responses to ink spots. With the psychiatrist not giving her the pass he wants Vala starts to get antsy on base. That night Woolsey appears to meet with her and asks for her help as a spy within the SGC in return for passing her evaluation. In the village that always sleeps the team try to find a solution to their problems, once again exploring the cave for anything Ancient. Teal’c and Mitchell decide to venture into a hidden passage they find while Carter returns to the village to help the medical team, finding a parasite that feeds on body chemicals released during sleep and eventually causes an aneurysm in those it feeds on once it grows too large. One by one the medical team, who’d been pulling a double-shift due to the Ori invasion, start falling victim to the parasite with two falling asleep and one of them eventually succumbing to the parasite. Things grow worse when the final awake member of the medical team has a fatal heart attack from all the drugs they’ve been taking to stay awake. In the woods Mitchell and Teal’c find and capture a lizard that seems to resist the effects of the parasite. Unfortunately Mitchell succumbs to sleep, leaving Teal’c to transport the lizard back to the village. Before he can make it back to the village the others in the village are found by an SGC medevac team who’ve arrived due to the lack of contact. Teal’c also succumbs to sleep just as he makes it out of the caves but is thankfully found by the medevac team who also bring the animal back with them which allows them to synthesise a cure. After recovering in the SGC Daniel reveals that the records on the planet did reveal references to Atlantis, making the trip not a complete waste of time and resources, only to be alerted to a situation in the gateroom that has Vala demanding to be let off-world. Landry and Woolsey however reveal that the offer to spy on the SGC, which she’d refused, had been the real test of her character which she therefore passed. Vala however, annoyed at being tricked, decides to make fun of Woolsey by claiming he made strange sexual advances during the request to spy. God, where to start with this episode. Well it’s a good thing that the A plot is about sleep as it’ll put the viewers to it. The idea of a plot where people can’t fall asleep is one of those that sound good on paper but rarely work out. The problem largely lies in the fact that it can’t portray the timespan long enough for the idea of staying awake to be tense or thrilling. I mean Christ who here hasn’t pulled all-nighters before and while they may be annoying they’re hardly that hard to pull off. Instead however they quickly start killing people off for really no payoff at all, in the end the episode going that the next leg of the adventure is actually in Atlantis. It also doesn’t help that the ending of the A plot is very rushed, with it largely being run over. Instead this is one of the rare episodes where it’s the throwaway B plot that really shines in the episode. Claudia Black has always been good at comedy and here she steals the show with a brilliant performance as Vala, with her trying to act innocent when she’s anything but in a series of increasingly ridiculous interviews which are just a delight to watch. In particular her encounter with a lie detector is a joy to behold, with her shocked reaction when it shows up her poor attempts at flattery a standout moment. The comedy had really been missing from the show in much of season 9 but Vala brings it back in such a great manner for season 10 as she becomes a main character. Even with the comedic aspect of her plot it still takes the time to set her up as this honourable person, with Woolsey reappearing in the subplot to get her to act as a spy. While she initially seems to go along with it to pass her tests it’s revealed she declined it, instead rather having dignity and leaving the base than sellout her friends. This part of the subplot still retains the comedic aspects, with Vala ending it with a way to get back as it were on Woolsey for tricking her. Overall the episode is largely a forgettable one outside of Vala’s substory, with a boring dry story that doesn’t really achieve anything outside of the interviews on base. · Love that little Blade Runner reference. · Surprised they didn’t also send through distracting activities like videogames. Nothing like an all-night LAN party to numb the senses.